This lesson really surprised me. To my surprise, what I learned here, has convinced be beyond a shadow of a doubt that Islam is the machine or kingdom of the Beast. Not only is this kingdom rising and spreading its influence FAR and WIDE, so is its MARK! I'm sure you won't be surprised about what I believe the mark is, BUT WHAT YOU MUST SEE, IS WHY I BELIEVE WHAT I BELIEVE. That I believe will be a surprise. No one is sharing this truth! If America is not a completely free nation when the Antichrist comes to power, she WILL LIKELY fall under his power. If we can come out from under the communistic advances made in this nation since 9-11 then America just might stay free during the reign of Antichrist. If however, we are unable to do so, not only will America fall prey to his terrible reign of terror, there will be no place for anyone to flee to. While investigating the Mark of the Beast, I looked at tattoos, RFID chips and all of the new technology. It is pretty obvious that any of these could fulfill the prophecies of the mark of the Beast. But none of them really fit what the Scripture says except for where the mark is placed. So it’s back to the Scripture about the mark of the Beast. There is one other place in the Bible where a mark saved someone from being killed. Do you remember the Mark of Cain from Genesis? Gen 4:15 = And the LORD set a mark upon Cain, lest any finding him should kill him. Ancient Rabbinical literature teaches that it was the Hebrew letter "Tav" that was put on Cain. The Protestants don't believe any visible mark was given. If it weren’t visible, how would anyone know he was marked by God and not to be touched? I tend to go with the Rabbi's on this. The mark was to instill fear because it meant that if you kill Cain, your punishment would be 7-fold more severe than the punishment given to Cain for killing Abel. Today, it is different. The Hebrew alphabet has changed a few times from the BC era to today. The Jews referred to this ancient "Tav" as "the sign." It was the sign for a curse and sin. Here in Genesis, with Cain we see it at the very beginning of our recorded Bible history. It shows up again in the middle of Bible history, with Jesus, as the sign of the cross. Both the cross that is the "Tav" rotated, means curse and sin. Cain was a man marked with sin and a curse and Jesus was the Son of God removing sin and its curse for all who come to Him. The "Tav" and cross, now stands for both. It is the visible symbol of the entry of sin and its curse into the world and the symbol of its removal. Now we see that same Mark again, in these end-times. Do you remember our teaching from 2006, "That which hath been is that which shall be?" (Ecc 1:9) Well, if the end of the world is like the beginning, we can expect to see this mark, the ancient "Tav" again, and in some very significant way! Hold this thought! Remember, the new Hebrew Tav is changed; we are looking for the ancient one. Back to Revelations and the mark of the Beast. John was told to WRITE WHAT HE SAW! I believe he did just that. 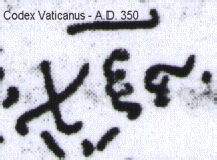 Take note, the oldest and most reliable manuscript pages of Revelations are in Greek. Our English Bibles pretty much are all translated from those Greek manuscripts. Rev 13:18 Here is wisdom. Let him that hath understanding count the number of the beast: for it is the number of a man; and his number is Six hundred threescore six. This is where we get our infamous 666 from, THIS VERSE ALONE! But, the translation is not exactly correct. Take a look! The Greek is what John wrote. Six hundred threescore six: χξς , chi xi sigma = they are SIMPLY THREE LETTERS FROM THE GREEK ALPHABET. THEY HAD NO MEANING IN JOHN'S DAY, they do not mean 666. NOTHING TO TRANSLATE THEM INTO! They weren't even a sorority. So, translators translated their numerical value instead, because the verse spoke of number and count, or so they thought. Do you understand? From the very first transcriber of John's letters to the very last translator, all they saw were three SYMBOLS that RESEMBLED three Greek letters, so they ASSUMED it was Greek letters. Then, when the translators went to translate it into English and other languages, they had absolutely no idea when the three letters meant. So they did the next best thing. Because the verse had a word that could mean count and another one that could mean number they took the three letters and translated their numerical value instead. You see, Hebrew and Greek letters both have numerical values, as do other languages. THE NUMERICAL VALUE IS NOT THEIR DEFINITION. Since they didn't know what the three symbols meant, and since they were very close to Greek letters, they selected these three Greek letters χξς and translated them into their numerical values, which is 6oo for the first symbol χ, 60 for the second symbol ξ and 6 for the last symbol ς or 666. IT WAS EITHER 666 OR LEAVE THE SYMBOLS AS THEY WERE! The thing is, I don't believe what John saw were three Greek letters, but three Arabic symbols instead. The line top is Arabic and the bottom line is Greek. To this day, the bottom three together mean nothing, other than a sorority. But the three top Arabic symbols do mean something. A very important phrase. 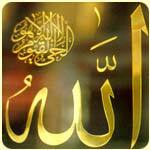 These three symbols together are called the "Bismillah” which means (literally) "In the name of Allah." 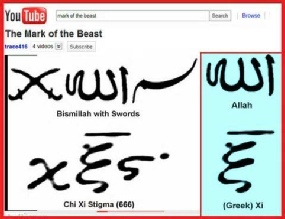 The Arabic often uses swords for the first letter because they symbol war or Jihad for Allah. Look at the meaning for the word mark in mark of the Beast. Notice it isn't necessarily something that is put under the skin. All of the words are something more surface and seen. It was most likely the top line that John saw. Here is that center letter simply rotated so you can see how close they are. This letter, the funny "W" that we are looking at, is the symbol for Allah. Today, these symbols are worn all over the world. 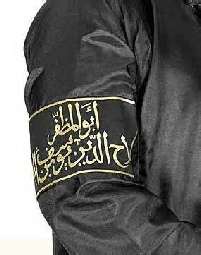 They are written on the banners, head and arm-bands that Muslims wear at protests, rallies, and parades and while dancing in the streets to celebrate a jihad victory, like on 9/11. 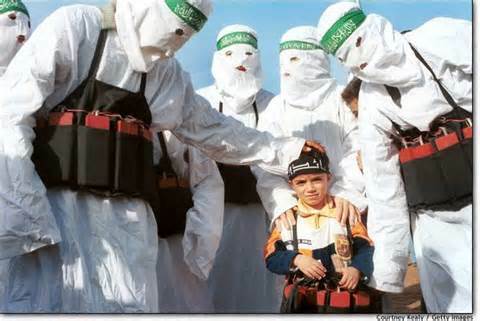 It is also what the Martyrs for Islam wear on their heads when they blow themselves-up yelling "Allah Akbar", or "Allah is the greatest." It is on the new Muslim coinage as well; because, everything in Islam is done, "In the Name of Allah." Look at the Scripture again. Rev 13:18 (KJV) Here is wisdom. Let him that hath understanding count the number of the beast: for it is the number of a man; and his number is Six hundred threescore and six. Allow me: Here is wisdom. 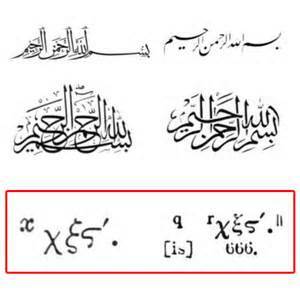 Let him that hath understanding calculate (count) the multitude (number) of the beast: for it is the multitude (number) of a man (Muhammad); and his multitude (number) is χξς "in the name of Allah"
I don't see how anyone can get away from what John wrote as the badge or mark that he saw the people wearing, and that it is being worn today all around the world. Simon Altaff, a Christian who was once a former Terrorist, and Walid Shoebat, also a Christian who was a Terrorist, saw the manuscripts at separate times and places. Immediately, they both recognized this characters as Arabic. Other Christian Arabs make the same claim that this photograph of the manuscript shows the Arabic, Islamic "Bismillah," which means, "in the name of Allah." Muslims have also stylized the "bismillah" so that it will not be readily recognizable in the West. They turn it every which way, as well as shape the word rather artistically like you see below. It makes it more difficult to find the "Bismillah." Nonetheless, Muslims ALWAYS recognize it in the same way Americans recognize stylized English words. 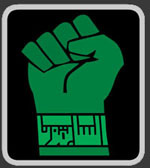 A Washington DC Muslim cleric recently created this symbol for the upcoming war in America that most people do not believe is coming. 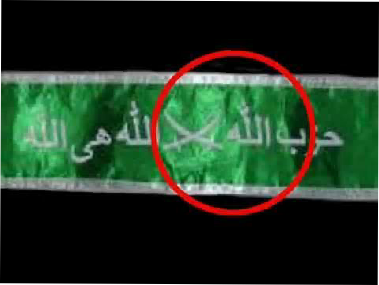 Notice that it is on the right hand and bears the stylized bismillah. 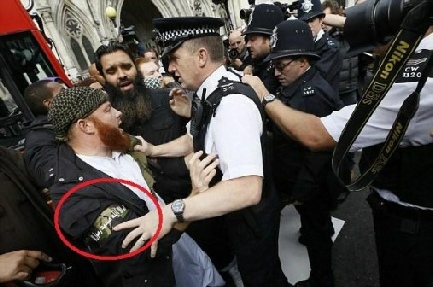 The Mark of the Beast, is that Arabic writing across their Jihad head and arm-bands which says, "in the name of Allah." Jihadists do everything in the name of Allah. One more thing: One of the things that I had a hard time understanding for many years is that Revelations says that people will be beheaded for their faith. Until a few years ago, I couldn't imagine beheadings in modern times. I wondered if guillotines were going to be erected all around the world. But what has been revived? Beheading! Tens of thousands have been beheaded in the Middle East for not accepting Allah. Imagine that! Revelations is right. And now what are people saying? They say, how can we win a war with the terrorists? Revelation 13:4 And they worshipped the dragon, which gave power unto the beast: and they worshipped the beast, saying, Who is like unto the beast? Who is able to make war with him? Do you see IT? The "mark of Cain," the ancient "Tav" ? Here it is, showing up in the end times, just as it was possibly present in the beginning. I mentioned to you in a past lesson that the Hebrew word 'âlâh, means curse. Not the same exact spelling, as Islam's Allah, but the exact same pronunciation. Couple that with the ancient "Tav" that is the sign for sin and its curse. Here we have the ancient "Tav," sin and curse with the sign for Allah who we know is a curse, both together on the symbol for the mark of the Beast. Could this be God pointing to the CURSE of Allah and Islam in the last days? You find this Hebrew word alah, for curse, throughout the Prophets where God speaks of the end-times. Did you know that Muslims headed 2 of Hitler’s SS Nazi divisions with orders to kill all Jews in the Middle East? 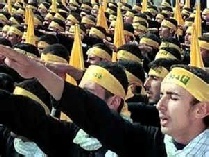 Muslims still use the Nazi salute. The Bosnian Muslim Nazi SS Division: Heinrich Himmler and the Hitler's Soviet Muslim Legions - Waffen-SS im Einsatz. Isn't it interesting that under Clinton we helped the Bosnian Muslims against the predominantly Orthodox Christian Serbs. Just who are we in bed with? I think that is pretty evident. The mark is already in place. Beware! It is later than you think! !